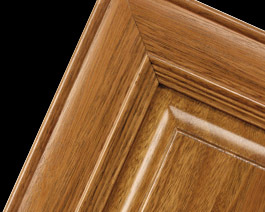 Lyptus is one of Royal Cabinet Company's favorite woods to use for our New Leaf Cabinets environmentally friendly “green” line. Many factors distinguish Lyptus from other hardwood species. A natural hybrid of Eucalyptus grandis and E. urophylla, Lyptus thrives in the warm climate of Brazil, permitting harvesting in just 14 to 16 years as opposed to 50 to 70 years in older regions. It is processed using best-of-class technology, assuring a top-quality product. 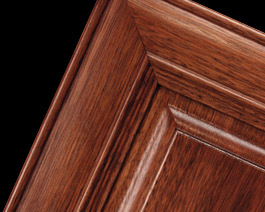 Lyptus wood appears very much like mahogany, but it comes without the negative association of rain forest clear cutting. Click on the Thumbnail image to see a more detailed view.